A stimulating, crisp and slightly sweet aroma that is great for memory and nervous complaints. 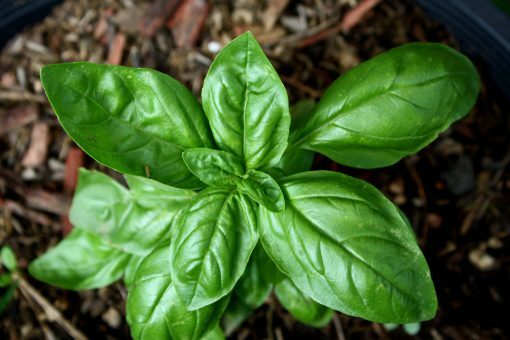 Basil, which is well known as a culinary herb, has been highly regarded in India as a brain and memory aid. As a nerve tonic it a wonderful oil for nervous tension and anxiety and other psychological complaints, epilepsy and paralysis. It has a very uplifting and stimulating aroma that lifts the mood as it awakens the senses and the mind. It’s a staple in many headache and migraine blends and is a decongestant making it good for sinus and respiratory issues, coughs and colds. As an antispasmodic, Basil is a good addition to massage blends and is useful for female issues and menstrual cramps. It’s antibacterial properties make it a useful oil for acne and other skin infections. Another interesting quality is Basil’s ability to stimulate the olfactory system in those that have loss their sense of smell! We love Basil essential oil and it’s digestive properties. We even use it in cooking by adding just a few drops (2-4) to a family sized dish to give it an rich basil flavor. Our favorite is to add to a finished Italian based sauce just before serving, in the place of the fresh herb. Remember to use sparingly in this regard or the oil will take over the flavor of the entire meal. Warnings: Some varieties are high in phenols which are known for anticoagulant activity. Our variety is more mild, the Linalool chemotype.